If your budget allows for it, you may want to hire a wedding planner, but if it doesn’t, then you have a lot of tasks ahead of you. One of the many important ones will be planning your wedding reception. First, you will need to decide on the type of wedding you are having. 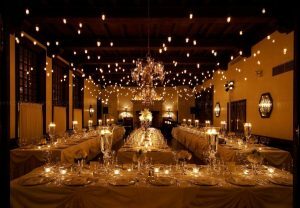 If it is casual then you have additional options as to how, and where you want your reception to be. For example, maybe you are going to have a beach wedding. In this case, you may decide to have your reception here as well, which would probably mean having simple catered food fare or a buffet. If your wedding is going to be more formal than your reception, you will have to follow in the same manner. This means you are going to have to book your reception hall early. Now it means that you are going to have to compile your guest list so you know how many plates of food to order at your reception. The one thing you are going to discover is that with wedding planning, one thing leads to another, and many of the completion of tasks depends on another. When choosing your reception venue, ideally you want it close to the area where you are having your ceremony conducted. This makes it easier for your guests to go from one event to another. If there is going to be a time span between the ceremony and when the actual dinner is going to be served, you may also have to arrange for a cocktail hour to keep your guests entertained. So timing is very important. There is usually a short period of time following the ceremony slotted for picture taking, so you need to provide something for your guests during this time.